The Federal Reserve lifted interest rates yet again on Wednesday. Here is how investors should be thinking through the policy decision. This is the real-time analysis you can't afford to miss, via TheStreet. You're welcome. Powell says he sees "concern" on trade, but doesn't see these concerns in macroeconomic data. Stocks turned slightly green around 3:00 p.m. Investors may like Powell's continued pledge to stay data dependent. All this inflation talk by Powell makes it easy to see why investors have dumped airline stocks such as Delta (DAL and Southwest Airlines (LUV . But, there are reasons to be bullish on the space despite inflationary pressure in oil. Watch below. Powell thinks inflation will top 2% this summer thanks to rising oil prices. Powell struck an upbeat tone on the health of the U.S. economy when asked about rising trade concerns. Rockwell Automation (ROK CEO Blake Moret is bullish on his business, too, given his conversations with customers. Watch below. The 10-year yield spiked on Wednesday. Stocks clawed back their losses during Powell's prepared comments. 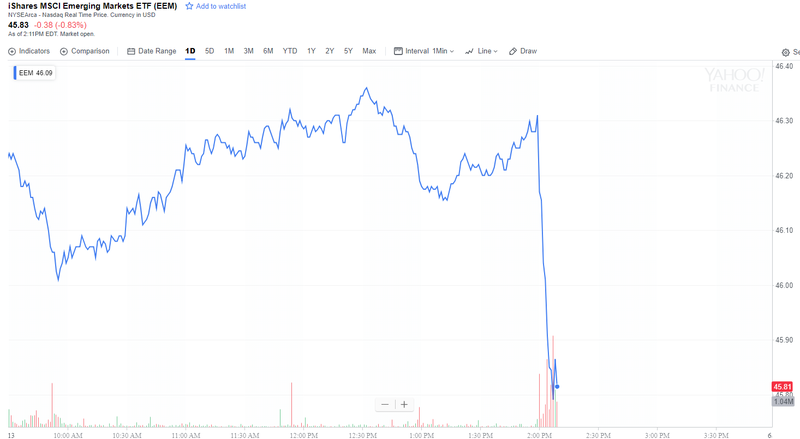 The Dow Jones Industrial Average down only 10 points as of 2:42 p.m. after being lower by more than 70 points after the decision. "The outcome of today's FOMC meeting leaned a little hawkish. The closely watched median interest rate forecast "dot" now looks for two more hikes this year (after today's well-anticipated hike). While that move in the median reflected only one participant moving their outlook, it is likely that several of the more influential Committee members now anticipate two second-half hikes. Moreover, the median for next year also moved up by a hike, and eight participants now expect a funds rate above 3% by the end of next year, up from six in March. The economic forecasts also leaned hawkish, as the unemployment rate projections were lowered, while the sustainable rate of unemployment was left unchanged. Growth and inflation were revised up a touch for this year. Finally, we read the statement as somewhat hawkish. Monetary policy continues to be characterized as "accommodative," even after today's hike, and the outlook still calls for "further gradual increases" in the funds rate. Moreover, there is no longer an expectation that the funds rate will remain below neutral for some time, consistent with the dots that show policy turning restrictive as soon as next year. (There were some other much-needed edits to superfluous language in the statement.) Lastly, the description of the economy was upbeat and there is no longer a reference to inflation expectations being low. Overall, the Committee appears more comfortable with the outlook, and with the need to steadily normalize policy and eventually to go to modestly restrictive territory. We continue to look for a hike a quarter this year and next." "The USD rally stalled somewhat at the end of May, but the hawkish picture painted by this FOMC meeting is likely to reinvigorate the currency. The USD is likely to appreciate most significantly against high beta G10 currencies and EM FX, given that the market should recalibrate expectations for the tightening pace of the Fed. This creates a challenging combination of higher US rate expectations without any material upgrade to US growth expectations. Uncertainty over tomorrow's ECB meeting may temper the extent to which a stronger USD is mirrored by a weaker EUR for now, but we would expect GBP-USD to resume its decline towards our target of 1.3150." Powell makes a visual change: decides to stand during his press conference unlike his two predecessors. Also says he will hold a presser on each FOMC decision day, or twice the number of conferences, starting in 2019. A quicker pace of rate hikes is being viewed as good news for banks. When rates rise, banks tend to earn higher profits. Shares of Citigroup (C , JPMorgan Chase (JPM and Bank of America (BAC all popped instantly after the Fed decision. Citigroup and JPMorgan Chase are holdings in Jim Cramer's Action Alerts PLUS. The iShares MSCI Emerging Markets ETF (EEM tanks on the Fed decision (see below). Higher interest rates could lead to a capital flight out of risky emerging market assets. This has already started to play out. Fed's projection data signals an expectation of rising inflation in 2019 and with it, a Fed funds rate above 3%. See below. Says eTrade vice president of investment strategy Mike Loewengart: "The Fed has telegraphed this hike for months, surprising exactly no one. But confirming suspicions around four instead of thee hikes this year is big news-it will be interesting to watch as rate-sensitive sectors like financials and consumer discretionary benefit from this faster pace. This could be a buy the rumor sell the news situation as this more aggressive posture has been bandied about for the past few months." Fed calls out "gradual increases" in rates. Market overlooking this mention, for now. Fed sounding hawkish right out of the gate. "Information received since the Federal Open Market Committee met in May indicates that the labor market has continued to strengthen and that economic activity has been rising at a solid rate." 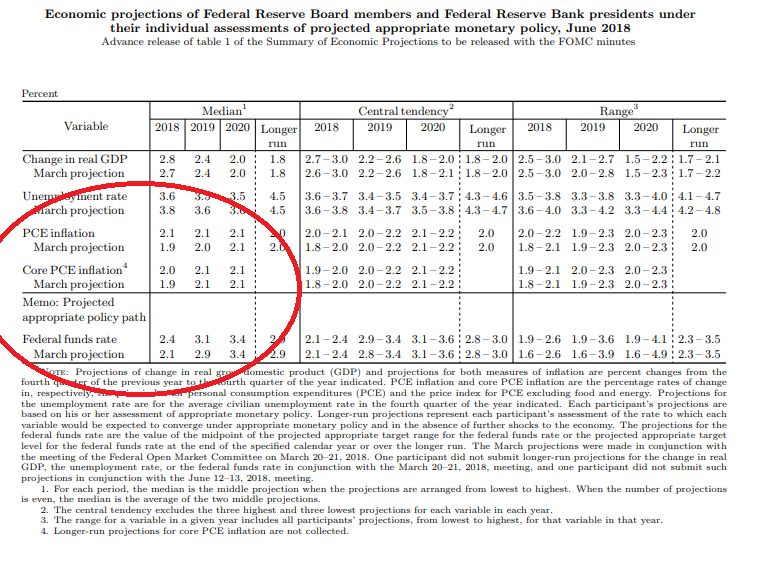 The Fed doesn't stop there -- it keeps hinting at inflation in the first paragraph. Here come the steady rate hikes. "Job gains have been strong, on average, in recent months, and the unemployment rate has declined. Recent data suggest that growth of household spending has picked up, while business fixed investment has continued to grow strongly. On a 12-month basis, both overall inflation and inflation for items other than food and energy have moved close to 2 percent." Fed decision day reminds us of our chat a few weeks ago with Minneapolis Fed chief Neel Kashkari. The below exchange was especially insightful. TheStreet: What's the risk of the Fed moving too fast to raise rates? Kashkari: I think the risk is that we do it too fast unnecessarily and we shorten the economic recovery. One thing I look at is the shape of the yield curve. And the yield curve has been flattening quite a bit. The inverted yield curve is the single best predictor we have of recessions. To me, it's an indicator of the Fed overtightening. So if we keep raising rates despite the fact the yield curve is flattening, if the long end of the curve does not move up, if inflation does not emerge and we just keep raising rates we could end the expansion by being too aggressive on monetary policy. So it is something I am worried about, and I pay close attention to.